Today on Ironworx, we spend the first half catching up on some personal life changes for Josh that could have an effect on the show…positive, for sure…but no spoilers yet! We also have a call from Zach “Too Nice For Rice” Zabala, and of course, Hank. They have settled in New Mexico for the time being, but job opportunities, or lack thereof, along with the approaching winter, might necessitate a journey to more temperate climes. Zach has been Flat Smacking…ever so gently, of course. That is The Way of Zachness. He has planted good seeds on fertile ground, from what we hear! –Our pal Alan Holman pops in for the 2nd Hour, telling us legal sales of cannabis in Canada are set to launch Oct 17, so he may be able to indulge in the healing herb without the onset of paranoia-driven headaches…here’s hoping, Alan!! 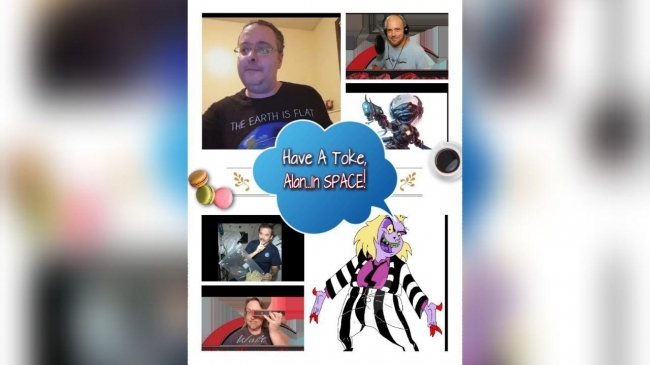 –Alan also shares an episode of Beetlejuice the refers to the Earth being Flat…#HiddenInPlaneSight. –Goblin Planets may show us where Nibiru is niding, the COTUS sent us all a text, prep for Aliens…which are already here. –Walt shares good news from the OTHER La: BATON ROUGE, La. (Aug. 1, 2018) – Today, two laws that expand the state’s medical marijuana program and further nullify federal cannabis prohibition in the Pelican State went into effect. Rep. Ted James (D-Baton Rouge) sponsored House Bill 579 (HB579). The new law expands access to medical marijuana to individuals suffering from glaucoma, severe muscle spasms, intractable pain, Parkinson’s disease and post-traumatic stress disorder. Rep. Vincent Pierre (D-Lafayette) sponsored House Bill 823 (HB823). The new law prevents the state’s medical marijuana program from expiring in 2020, as called for under the law as it was originally written. “This will help address a growing opioid crisis, prolong life, make life more enjoyable for some people and save some lives,” Rep. James said. HB579 passed the House on Apr. 12 by a 60-40 vote and then passed the Senate by a 21-13 vote on May 9. HB823 was approved by the House by a 69-26 vote on Apr. 18 and then passed the Senate by a 25-9 vote on May 9. After Gov. Edwards signed these bills on June 1, HB579 and HB823 are officially binding in the Louisiana state code as of Aug. 1, 2018. Despite the federal prohibition on marijuana, measures such as HB579 and HB823 remain perfectly constitutional and can lead to drug laws being further nullified down the line. Strange World # 195 with Mark Sargent.. Lets Go Back To Quantum Basics..
Nar Holes and Free Speech..